Cobb salad is known as a colorful, very attractively arranged type of garden salad. It was the most sought after item on the menu of the Hollywood Brown Derby and it got its name from the man who first introduced it and he was Robert H. Cobb. For those who may not know, Brown Derby was a successful chain of restaurants in Los Angeles. The Cobb salad was born when Robert H. Cobb wanted to welcome one of his important guests in a rather special way. Hollywood actresses and actors started ordering it as well. As a consequence, all the other restaurants and hotels had to add Cobb salad to their menu cards. The original Cobb salad contained tomatoes, garlic, crisp bacon, black pepper, lettuce, lemon juice, chives, salt, chicken breast, spices, hard cooked eggs, herbs, avocado, vinegar, Roquefort cheese and salad oil. 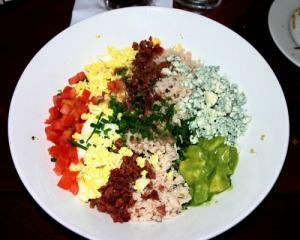 Nowadays, there are many varieties of the Cobb salad. Different varieties of the famous Cobb salad are served in numerous restaurants everywhere around the world. Most varieties contain iceberg, Roquefort cheese, lettuce, hard boiled eggs, tomato, chicken breast and bacon. There are a growing number of people who are very cautious about their calorie intake so there are also certain low calorie varieties of Cobb salad as well. A serving of dry Cobb salad for one person contains up to 393 calories. A serving of 248 grams of ready pac Cobb salad contains 410 calories. A serving of McDonald’s California Cobb salad which weighs approximately 334 grams contains 280 calories. Each serving of red robin Cobb salad contains 451 calories. It does not contain any bread, dressing, bacon or blue cheese. A serving of 308 grams of Cosi Cobb Salad contains 419 calories. Each serving of 237 grams of McDonald’s California Cobb salad without dressing and chicken contains 160 calories. A serving of 536 grams of Uno Chicago Grill classic Cobb salad may contain up to 630 calories. Each serving of 518 grams of Old Spaghetti Factory Cobb salad without any dressing contains 700 calories. Cobb salad is jam packed with various nutrients.